Lake Abram is the largest remaining glacial wetland in Cuyahoga County. With its surrounding marsh and upland areas, Lake Abram makes up 80 acres of unique and critical wildlife habitat that is home to migratory birds, waterfowl, wild turkey and much more. A boardwalk stretching nearly 0.25 miles offers scenic views of the expansive wetland complex. The pre-historic play pit and Mastodon dig site are a fun place for kids to explore and experience what it may be like to be a scientist on a real dig site. 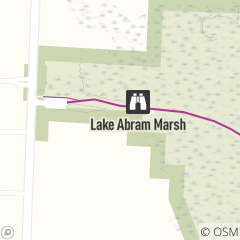 The Eastland Road Trailhead at Lake Abram is the northern end of the 2.4 mile Lake to Lake Trail that connects it to Lake Isaac to the south. It is located on Eastland Road, 0.5 miles north of Bagley Road.